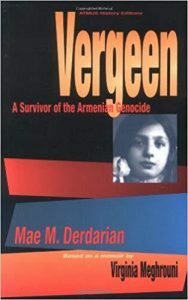 This is the heart-rending, true story of a girl’s indomitable will to survive the 20th century’s first genocide. Through her recollections, the brutalities endured by two million Armenians during World War I come to life and are mirrored a generation later by Hitler’s attack on the Jews. Destined for slaughter in the blistering Syrian desert, Vergeen and her widowed mother are deported from their home by the Ottoman Turks and forced into “death caravans” like all Armenians living in Turkey. Miraculously, during the long journey on mules and on foot, they withstand the barbaric atrocities until Vergeen is sold to an Arabic nomad. A bright and courageous teen-ager, Vergeen escapes after a year-long, intolerable existence as a Bedouin slave, eventually finding sanctuary and love in a German-Turkish railway camp. Years later, after the war, she comes to America where she is finally able to mend her young life.